I’ve been pecking away on the keyboard for his little blog project for a little over three years now. The page views are steady (which continues to surprise me considering the slackish effort the writer usually puts into his posting.) and I have accumulated a diverse group of followers/subscribers. All continents are represented and I’ve gotten to “know” some other like minded souls scattered about the world through this project. I’m actually not sure what I was expecting at the time I started but the experience has been (and continues to be) a good one. A few weeks ago I received an unsolicited handwritten envelope that contained a note, a fuzzy picture of some plants and a tiny foil-wrapped slip of seeds in it. After a second or two of head scratching I recognized who it was from. This little gift was sent by the spouse of one of mrs cohutt’s childhood friends; they were early followers and among the first outside of “family”. (They visited us one Saturday for lunch early on in this boondoggle so they also know the challenge mrs cohutt has in keeping me from starting the newest-overkill-tangential-garden-absurdo-project every other month.) They do grow a little but their lot is better suited for shady lounging with their monstrous canines; I wondered what seed they could possibly be sharing. The answer: Mizuna. Not plain old green mizuna, but a purple variety that I’d not know existed before the surprise gift. (If you aren’t familiar, follow this link for a little more info). I was pleased and decided best get them in the ground so a fitting “thank you” could be posted. I was in the process of finding spots for the early fall plantings at the time and segregated a corner to cultivate this little bonus. I am almost always too impatient to label my plantings at the time the soil is disturbed, but I relegated this little corner to memory then hastily continued with the other plantings scheduled for the evening. Well, baby purple mizuna looks a whole lot like baby green mizuna; in fact it also looks like baby kale, mustard, turnip greens, lettuce etc. 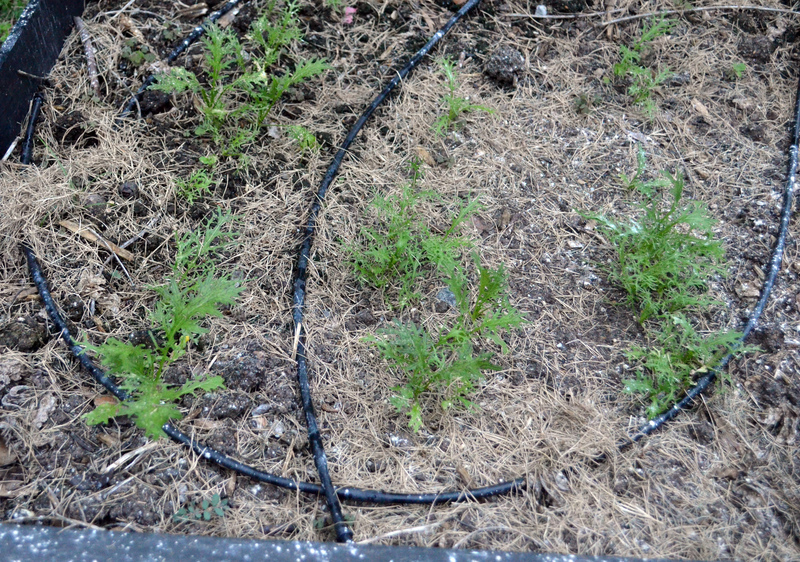 So just like that, the special planting of purple mizuna had been “swallowed into the grid”. This was actually a good thing as it was still August and this motivated me to pay closer attention to all my sprouted fall greens in an effort to conserve and protect the “special” ones wherever they lay. 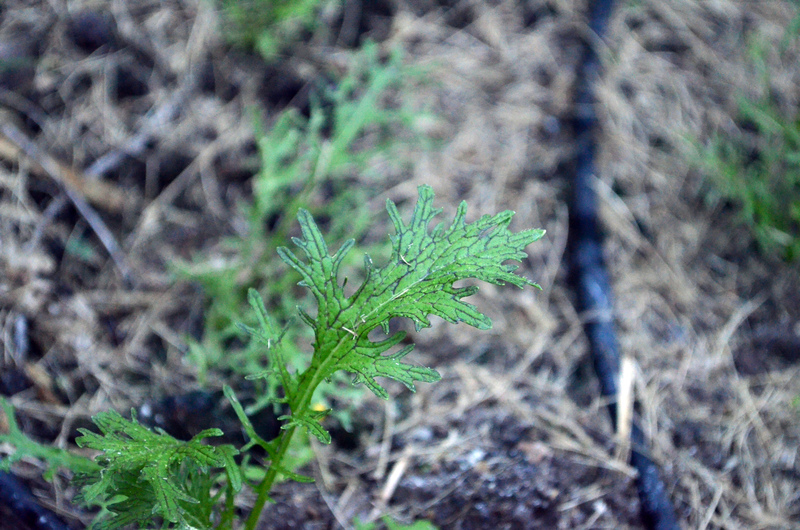 A few days ago I was able to identify two little sections of mizuna but alas, both were green. My concern was rapidly increasing; did I even plant the purple? Where are you purple mizuna? Last night, upon closer inspection (the “get on all fours with reading glasses” type) I detected an ever so slight red tint beginning to feather across the leaves of one of the plots. That is a great story Bruce. Your writing is entertaining, keep it up. FYI I put both sharp cheddar and cream cheese in a food processor then stuff the jalapenos with the resulting good.